associatedhairprofessionals.com 13 Some say hair is 90 percent of your selfie (and we agree! ), but there is that other very important 10 percent that should be in-sync with your hair in order to round-off your personal style. It's important to discuss your overall personal style with your hair professional when consulting about any hair service. 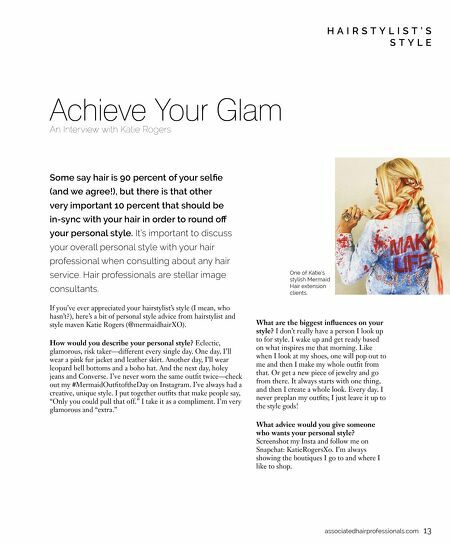 Hair professionals are stellar image consultants. If you've ever appreciated your hairstylist's style (I mean, who hasn't? ), here's a bit of personal style advice from hairstylist and style maven Katie Rogers (@mermaidhairXO). How would you describe your personal style? Eclectic, glamorous, risk taker—different every single day. One day, I'll wear a pink fur jacket and leather skirt. Another day, I'll wear leopard bell bottoms and a boho hat. And the next day, holey jeans and Converse. I've never worn the same outfit twice—check out my #MermaidOutfitoftheDay on Instagram. I've always had a creative, unique style. I put together outfits that make people say, "Only you could pull that off." I take it as a compliment. I'm very glamorous and "extra." What are the biggest influences on your style? I don't really have a person I look up to for style. I wake up and get ready based on what inspires me that morning. Like when I look at my shoes, one will pop out to me and then I make my whole outfit from that. Or get a new piece of jewelry and go from there. It always starts with one thing, and then I create a whole look. Every day. I never pre-plan my outfits; I just leave it up to the style gods! What advice would you give someone who wants your personal style? Screenshot my Insta and follow me on Snapchat: KatieRogersXo. I'm always showing the boutiques I go to and where I like to shop. 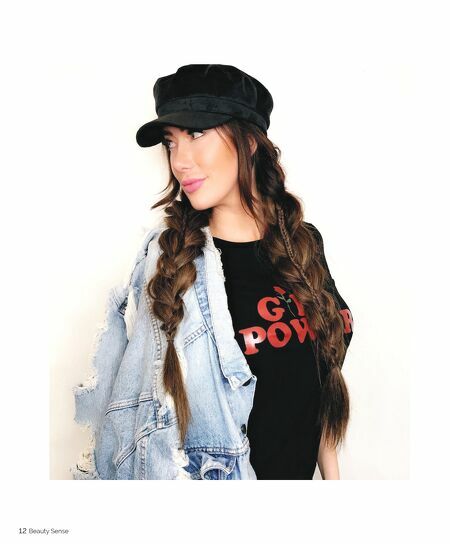 Achieve Your Glam An Interview with Katie Rogers H A I R S T Y L I S T ' S S T Y L E One of Katie's stylish Mermaid Hair extension clients.